What do you get if you take a 200-year-old, north London horse hospital and chuck in some cabaret dancers, bottomless drinks and a pergola rooftop? The answer is Fest Camden. This immersive new venue, which had a soft launch in April, is now fully up-and-running, and we love what we’re seeing. The multi-faced site offers anything from cocktails and cabaret, to pizza and live music. With a capacity of up to 1,000, it’s suitable for anything from small-scale summer parties and product launches, to full-blown corporate functions. Given a contemporary face-lift while retaining the natural Grade II-listed charm, Fest Camden is undoubtedly trendy. The main room (The Gig Room) echoes Bondi Beach, with hanging surfboards and neon palm trees, skylights, club booths and a high-end D&B audiotechnik sound system. It can host up to 350 people, so great for a big bash. 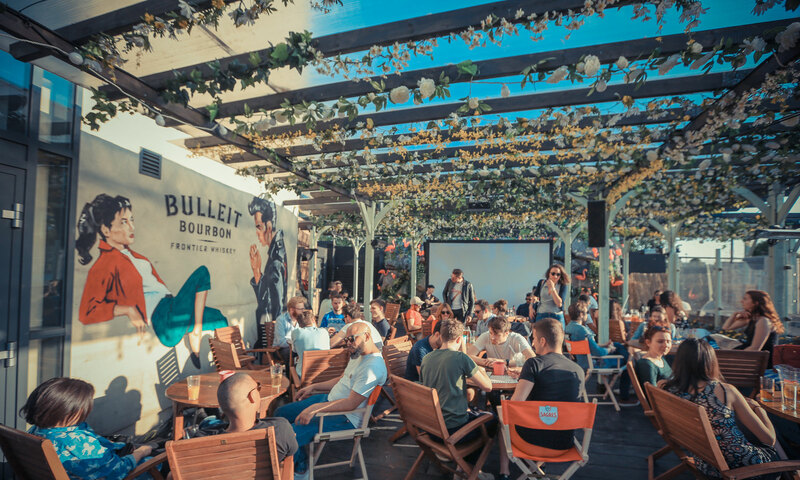 The rooftop bar (which can be heated and covered) is laden with hanging plants, lush greenery, and features a pergola – not to mention views of Chalk Farm Road and Camden stables. For smaller gatherings, book the 200-capacity, speakeasy-like Birdcage, or opt for the Fest Party Stables. Like what you hear? DDR rates start at £75pp – get enquiring using the button below.